Now age 40, New Orleans native and current Pittsburgh resident K. Rose Quayle was first committed to a mental hospital at the age of 15 for Bipolar II and an eating disorder. She spent her teens trying to control her mental illness through various medications, and by the time she got to her 30s, her illnesses had stopped responding to medications, so she decided to try electroconvulsive therapy (ECT). K. Rose Quayle sitting on the right during the Q&A. 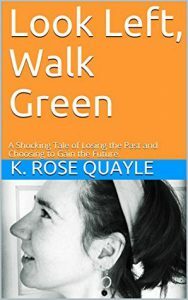 Last year she released a self-published book called Look Left, Walk Green: A Shocking Tale of Losing the Past and Choosing to Gain the Future, which she says she hopes will serve as a guidebook to various mental health treatments, especially ECT—one of the most feared and stigmatized treatments, and one of the least understood. 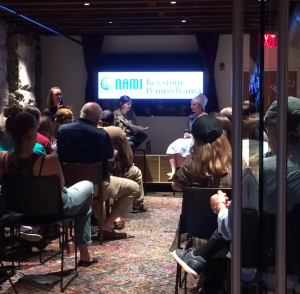 She spoke about her experiences last night at the National Association of Mental Illness (NAMI) Keystone Pennsylvania event series “Stories that Heal” at City of Asylum in Pittsburgh. “ECT is being used more, but a lot of people don’t know what to expect afterward,” said Quayle, who had 15 treatments eight years ago. Her book is organized in three sections: what it feels like to have ECT; the mechanics and physiology of the treatment; and the history of ECT and how the media and medical establishment have represented it. She said her husband showed great patience with the slow pace of her recovery. She stressed the importance of asking for help. Even after all the years that she had sought treatment for bipolar disorder, when the severe side effects of ECT showed up, she said, “I didn’t want to ask the doctors for help because of the stigma.” So that’s how persistent stigma still is—but she moved through her fear and asked for help anyway, from doctors and from friends. “True friends will come toward you in situations like this,” she said. She said her treatment has changed her character. “It has made me more empathetic and willing to reach out to others,” she said. Follow Rose on Instagram @lookleftwalkgreen and on Twitter @LookLWG. The next event in the “Stories that Heal” reading series is Lindsey Smith, author of Eat Your Feelings: The Food Mood Girl’s Guide to Transforming Your Emotional Eating. You can reserve your seat here. 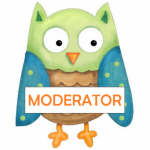 Previous story Is Depression Something You Can Control?